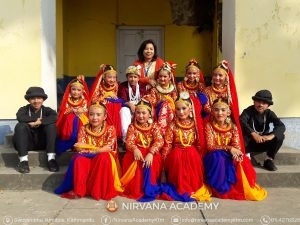 The Inter School Cultural Dance Competition at Anandakuti School in Swoymabhu on the 3rd of December 2018 had the IVth and Vth graders of Nirvana Academy in the pool of competition. The Nirvanian kids weren’t well prepared for the dance event because we got the message just few days before. In the arena of the competition, our kids had no trace of nervousness in them. They competed with fullest vigour. Since, it was a cultural dance competition, our performance had a well-knit story blended with the Royal Family culture of Nepal. The dance sequence featured the damsels dancing to please the King and ultimately the latter gets so engrossed that he joins them making it a grand show. We are content because with very little practice our kids a huge round of applause from the audience.